← Hard Drive Kidnapping – GpCode Ransomware On The Attack Again! Ultimate Windows Tweaker is a freeware utility for tweaking and optimizing Windows Vista, and now Windows 7 – both 32-bit, and 64-bit versions. This small (235KB), program has a clean, easy to understand interface that gives you access to over 150 system settings, some of which are hidden, and others that are just hard to find. The interface is organized for easy navigation, and it is complete with detailed descriptions for easy reference. The major benefit in using this type of tweaking application is the ease with which you can make changes to your system – without the drudgery of having to go through menu after menu, or manually editing the Registry to get the results you want. However, as with any application that makes changes to your system, use caution and be sure to have a verified backup. 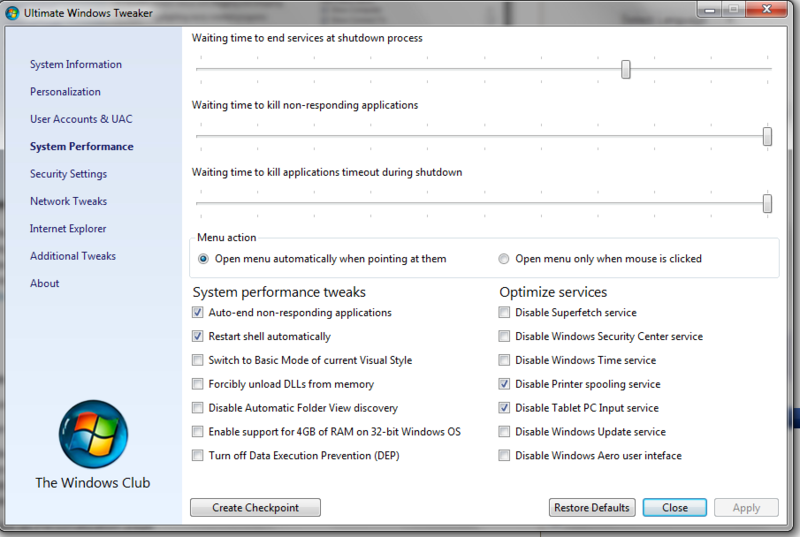 Fortunately, Ultimate Windows Tweaker allows you to create a system-restore point before you make any changes. 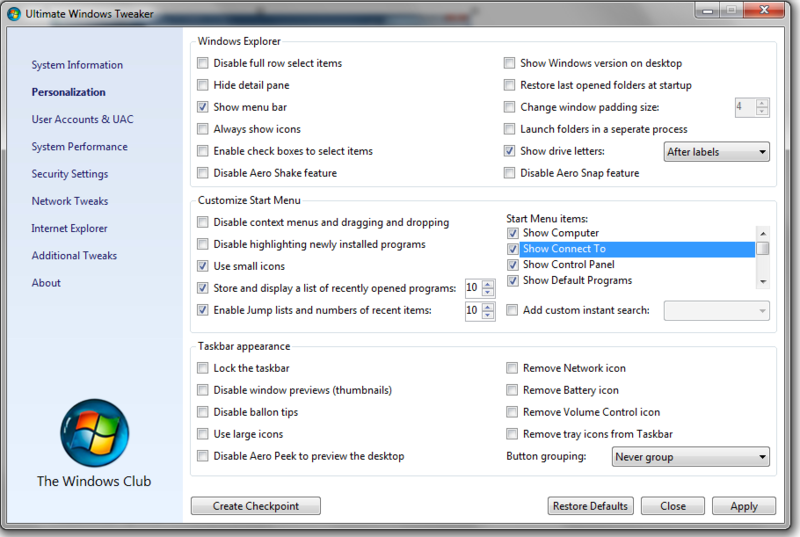 The following screen captures should give you a good idea of what you can accomplish using Ultimate Windows Tweaker. Personalization Tweaks. Click on any graphic to expand. System Requirements: Windows 7, Vista – 32 and 64 Bit. 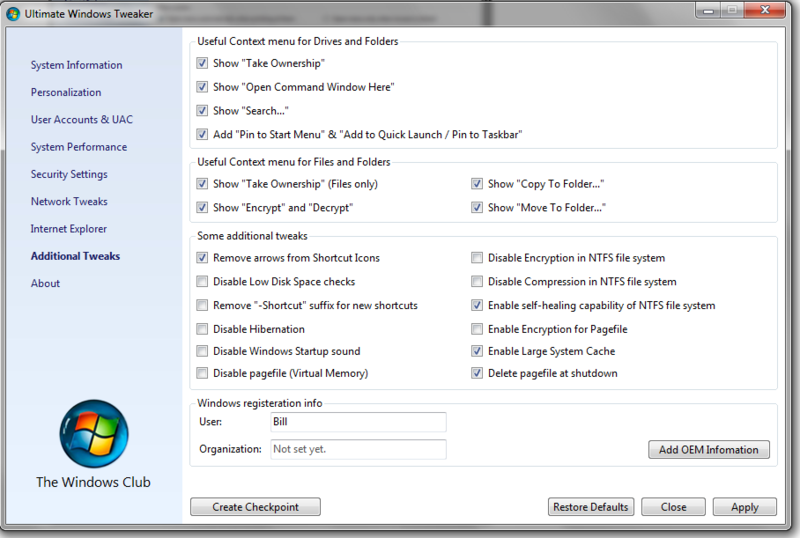 Bonus: Ultimate Windows Tweaker can easily be copied to a USB flash drive for portability. While this application is designed for advanced users, I see no reason why careful average users should have any problem tweaking their system using Ultimate Windows Tweaker. A very powerful little app but definitely not for novice. I use this with caution, although there is an option to restore the setting. Better to backup registry. If you want an easy and safety tweaking with a click, TuneUp is the way you go. Yes, you’re right Vhick. Backing up or setting a restore point is always good practice before making a system change.